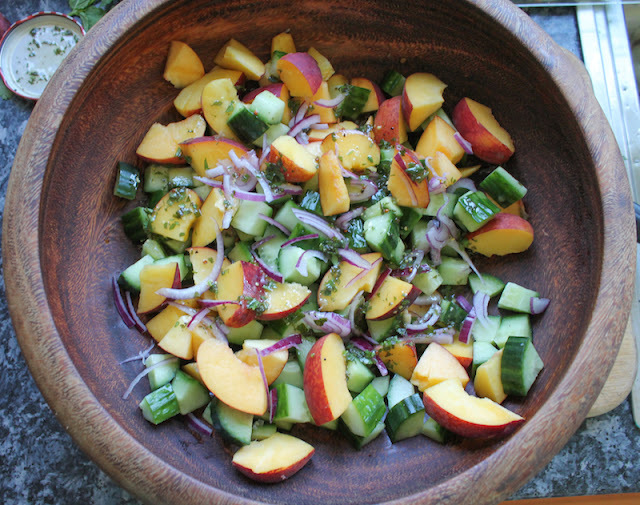 Fresh peaches that aren’t fully ripe can still be used in a fresh peach cucumber salad, adding a tart bite with a hint of sweet. 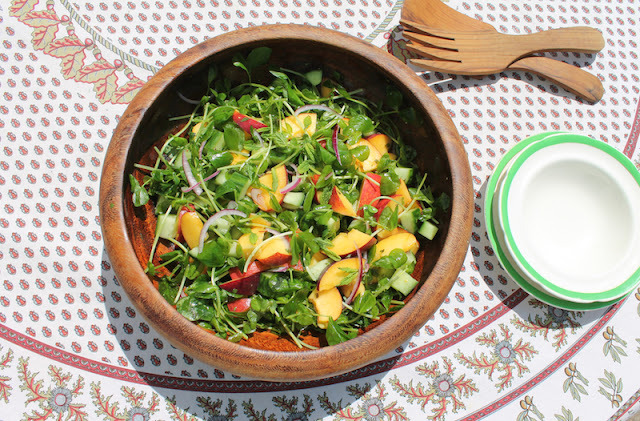 An herby dressing with mint and parsley complement the peaches beautifully. This week my Sunday Supper group are using peaches in a variety of recipes both sweet and savory. I’m in the Channel Islands right now where apparently they make no bones about the fact that the peaches are picked too young. 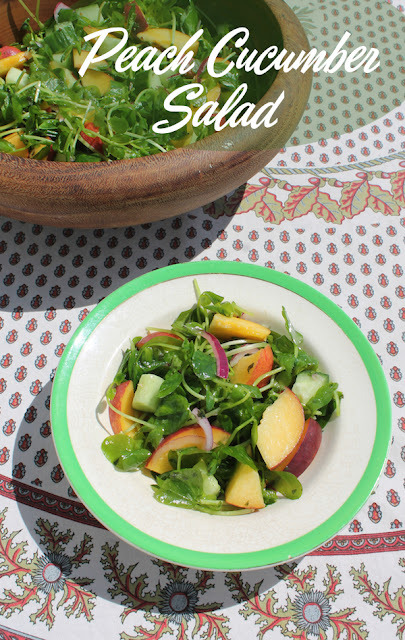 The little plastic boxes they are sold in say quite boldly – Ripen At Home. But I think we all know how that turns out. They really don’t taste the same or ripen well at home. Never mind, though, because slightly under ripe peaches are still tasty in salad. 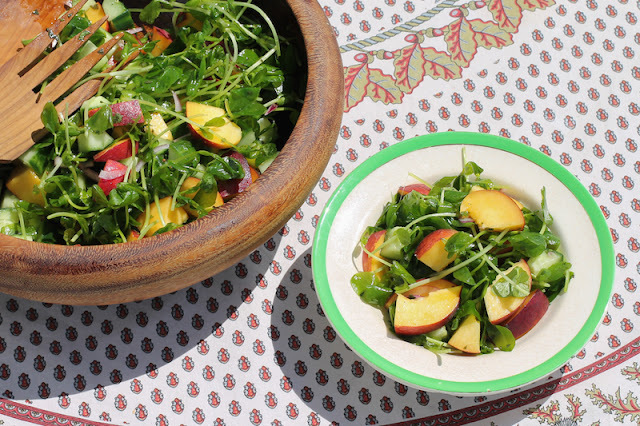 If you are fortunate enough to have good peaches, those work too! Put all the dressing ingredients in a jar. Close the lid tightly and give it a good shake to combine the ingredients. Set it aside at room temperature while you get on with prepping the salad. Cut your cucumber lengthwise in half, then cut the halves again so you have four long pieces. If the seeds are too juicy, you can but them off and discard. (My dog loves them!) Chop the cucumber into smaller chunks. 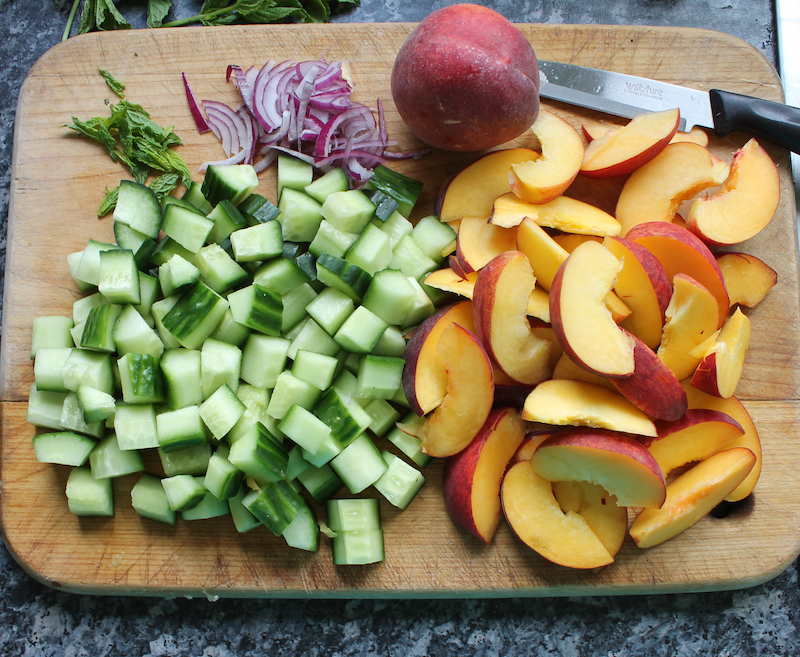 Cut the peach off the pit in slices, then cut those into smaller pieces. If you have freestone peaches, you can remove the pit, then slice and cut. 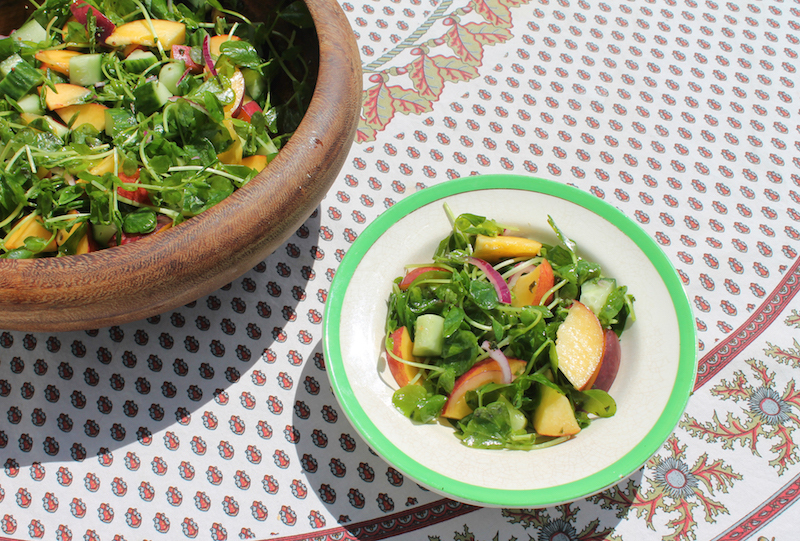 Add in the pea sprouts just as you are ready to serve and toss again. Many thanks to our Peachy Keen host, Sue of Palatable Pastime and our event manager, Renee of Renee’s Kitchen Adventures. Take a look at all the deliciousness we have for you this week! Join the #SundaySupper conversation on Twitter every Sunday! We tweet throughout the day and share recipes from all over the world. Our weekly chat starts at 7 p.m. ET. Follow the #SundaySupper hashtag and remember to include it in your tweets to join in the chat.